It’s a big world out there . . . come explore it with us! 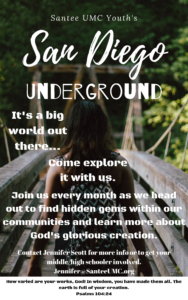 Every month, middle school and high school age youth will head out to find hidden gems within our own communities and learn more about God’s glorious creation! Contact Jennifer Scott for information on how to get involved!